With the VXi BlueParrott B250-XT-USB Bluetooth headset, listen to music or take calls with complete clarity. 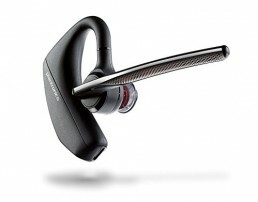 This wireless headset features 85% Ambient Noise Suppression and a 6mm bi-directional noise-canceling microphone. There’s no more need for you to turn off the radio while talking. The 66ft wireless range makes it convenient for you to talk wherever you are, even if you’re far from your smartphone. With the BlueParrott app, turn your smartphone into a walkie-talkie: Push to talk to one person or a group on Android or iOS phones. Conveniently charge your BlueParrott headset even while on the road with the Blucoil Car Charger. It provides an output voltage of 5 Volts and a current of 1 Ampere. The 5V charger features a universal micro-USB cable that works with other BlueParrott products like B350-XT, B550-XT, B450-XT, B250-XT-USB, and C400-XT. With a USB 2.0 Type A port and a US plug, this wall adapter provides an output current of 1000mA and has an external power supply (EPS) efficiency of Level VI. Additional 5-Pack of Blucoil Reusable Velcro Cable Ties to complete your bundle! XTREME NOISE SUPPRESSION – The B250-XTUSB Headset has 85% Ambient Noise Suppression and a 6mm bi-directional noise canceling microphone. Now you can make and answer calls without worrying about ambient noise overpowering your voice. WIRELESS COMMUNICATION – Compared to other products, the BlueParrott B250-XT-USB Bluetooth Headset has a wireless range of up to 66-Feet, allowing you to answer and make phone calls wherever you are. CONNECTS TO ALL BLUETOOTH DEVICES – Pair the B250-XT-USB Bluetooth Headset with any Bluetooth-enabled device. Answer phone calls and hear your navigation app simultaneously. COMFORTABLE ROADWORTHY HEADSET – You can wear the B250-XT-USB all day, every day without any discomfort. The headset is incredibly lightweight (2.52 oz) with an adjustable headband and flexible boom mic, which you can customize for a stable fit. 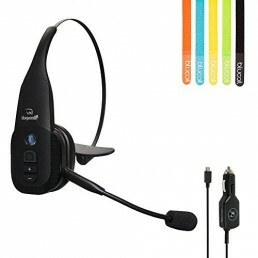 INCLUDES – VXi BlueParrott B250-XT-USB Noise Canceling Bluetooth Headset. Blucoil Car Charger with Micro USB Adapter. Blucoil USB Wall Adapter 5V 1000mA. Blucoil 5-Pack of Reusable Velcro Cable Ties.